Most of you know that Mark has been a diabetic since he was a small boy. Pictured above is a picture of him about the time his family received the diagnosis that he was diabetic. 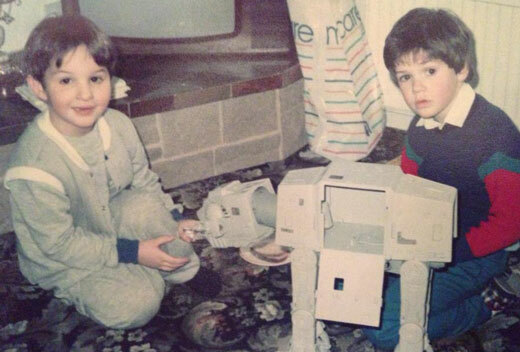 In the picture, Mark is on the left, playing with cousin Matthew who is on the right, when Mark’s family still lived in England. Those who don’t know Mark well, might not even be aware of his condition since he works a demanding job, has an active family and otherwise enjoys good health. One could easily be unaware that he is diabetic except for the pump he wears on his belt providing the insulin he needs to stay alive. In the summer of 2012 Mark went in for pre-op for a small surgical procedure. Mark & Lisa, and the rest of our family had no idea that the news he received from the surgeon a couple days later would be such a significant game changer. The doctor announced to Mark that he was in kidney failure and the surgery would be postponed. Diabetes is the most common cause of kidney failure in the US, but Mark’s doctors had checked him in the spring and weren’t concerned that failure was eminent. Upon hearing his diagnosis, Mark didn’t feel sick. Looking at him, I could only imagine that an error had been made and all would be straightened out. Days later he and Lisa sat in the doctor’s office for the first time hearing words “dialysis” and “transplant”, wondering when they would wake up from this bad dream. Mark was soon identified as a good candidate for a kidney and pancreas transplant. A new kidney would take over the work of cleaning the blood for the non-working kidneys; a functioning pancreas could make the insulin that his body currently doesn’t produce. Since his kidney failure was discovered over a year ago, Mark has struggled to feel normal. He goes to dialysis three nights a week. The process of removing all the fluid from his body is painful, leaving him cramping the next day. He pretty much works, goes to dialysis and rests to do it over again. The awesome news is there is available a life-saving organ transplant procedure that will change his life, and he is #2 on the local list to receive a transplant.